After months on the market, Windows 8 tablets have yet to rack up the sales Microsoft and PC vendors were originally hoping for. 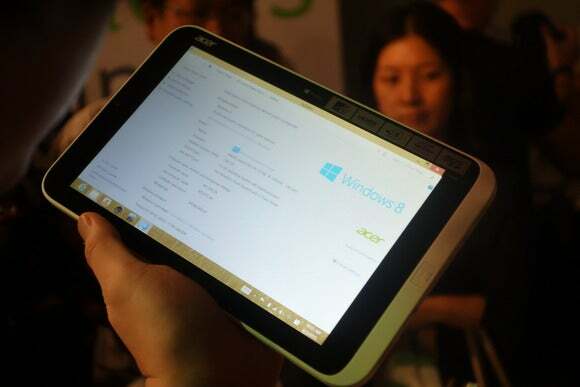 But on Monday Taiwanese PC maker Acer showed off what could be the first of many Windows 8 tablets to come in smaller screen sizes, following the success of Apple’s iPad mini and Google’s Nexus 7. Acer’s Iconia W3 claims to be the first Windows 8 tablet built with an 8.1-inch screen, and is small enough that it can be gripped in one hand. The new product was unveiled a day before the Computex trade show in Taipei, and the company made it available for hands-on use by reporters. Prices for the product will range between $400 and $500, according to Acer, making it more expensive than similarly sized tablets running Android or iOS. But in developing the tablet, Acer wanted to bring the power of a desktop PC to a handheld device, according to company president Jim Wong. Not only does it boast Windows 8, enabling people to run legacy Windows software, but also the Home & Student 2013 edition of Microsoft Office. In addition, the tablet uses an Intel Atom Z2760 chip, code-named Clover Trail, that features a dual-core processor with a 1.8 GHz clock speed. Despite its small screen, the Iconia W3 weighs at 540 grams, (1.1 pounds), making it over 200 grams heavier than the iPad mini and Nexus 7. The Iconia W3 also has less of a premium feel and is made of plastic, with a white rim in the front and a hard silver backing covering the rear. The tablet, however, still felt light enough in the hand, and applications ran smoothly, with lag only noticeable on certain apps, such as Amazon and Acer’s own embedded cloud storage, which were slow to load. The screen has 1280 by 800 resolution, but the pixels across it can appear noticeable up close. The Iconia W3 also features a camera on the rear and one in front. Shots taken with the camera, however, were somewhat grainy. To boost the tablet users’ productivity, Acer has designed a special keyboard that connects to the tablet via Bluetooth. Unlike some other attachable keyboards, the one fitted for the Iconia W3 is actually larger than the tablet itself, and similar to those used on 13.3-inch laptops. At the top of the keyboard is a long groove, where the tablet can sit. Once the tablet is removed, the keyboard will automatically power down. Acer also designed the keyboard so that it would be easy to carry, with the Iconia W3 in tow. Under the keyboard is a large hollow space where the tablet can be snapped in and tucked under. Acer has yet to determine pricing for the keyboard. But it could come bundled with the Iconia W3 in certain markets, for a higher price. The tablet will come in two versions, one with 32GB of storage, the other with 64GB. It has a microSD slot for additional storage, along with a micro-HDMI port, and a micro-USB port. Acer claims the device’s battery will last up to 8 hours.